Last year, I set a challenge for myself to read books by authors I’d seen at the Washington D.C.’s National Book Festival, roughly one author for each year I attended. I read eight books in total. Here is a review of two of them. 1999. Berkley. Paperback. 336 pages. I fell into the Anna Pigeon series back in the summer of 2004 when I was working in Bar Harbor. The town’s public library had #12 High Country in the new releases section. The titular Anna Pigeon is a forty-something park ranger and each book in the series takes place in a National Park. High Country had a great action / survivalist set-piece in Yosemite and it was that woman vs. nature element that hooked me into reading other books in the series. (Blind Descent was also one of my favorites, set in the claustrophobic setting of the Carlsbad Caverns.) Barr herself worked summers in various national parks so every book gave the sense that you were going behind-the-scenes, even if the mystery plots themselves strayed into incredulous territory. I haven’t read Barr in years, after I burnt myself out on the series by reading too many in a row. 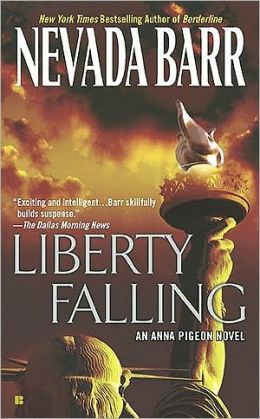 Liberty Falling was perhaps not the best one to pick up as a return to the series. Though the details about Ellis and Liberty Island were interesting, as a setting they didn’t offer the same opportunities for Anna to grapple with the wild as the larger western parks. Also, I found the determined cleverness of Barr’s writing to be hit and miss; sometimes her turn of phrase was really funny or apt, but sometimes the writing was too convoluted for its own good. The series is still ongoing – I see that the most recent entry, Destroyer Angel, is set during a canoe trip in upstate Minnesota (intriguing – my sister once went on a canoe trip with a friend in the Boundary Waters). 2004. Dial Press. Hardcover. 372 pages. 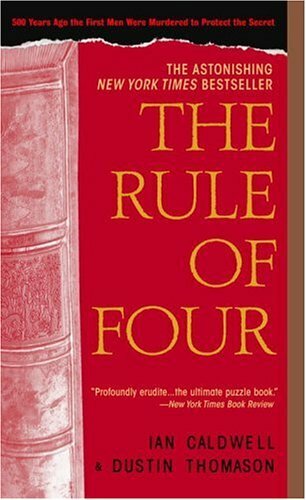 Genre-wise, The Rule of Four has kinship with The Da Vinci Code: smart people seek to solve mysteries hidden in ancient works which somehow leads to people getting murdered. This is normally not the type of plot I gravitate toward, but I remembered my longtime Festival-attending friend said she liked it, back when she read it in 2004. The ancient work featured in The Rule of Four is the Hypnerotomachia Poliphili, a dreamlike and cryptic 1499 Italian work. The two main characters are Princeton seniors who become obsessed with decoding the Hypnerotomachia. When a graduate student is publicly and dramatically killed on-campus, the mystery of the text becomes intertwined with the murder mystery. Academic infighting and Princeton traditions form the backdrop. Similar to Liberty Falling, I enjoyed how the authors’ inside knowledge of the setting (Caldwell went to Princeton) added believable specificity to the collegiate scene. I also liked the revelation of the hidden meaning of the Hypnerotomachia. Too often, when a book dangles its Secret throughout the book, the payoff isn’t worth all the hype. But Caldwell and Thomason invented a good high-stakes ancient Secret. I was impressed. Unfortunately, I was not very engaged with the characters and at times the book just dragged. I probably would have given up if I hadn’t wanted to finish it for the challenge. Breakfast at Tiffany’s by Truman Capote. 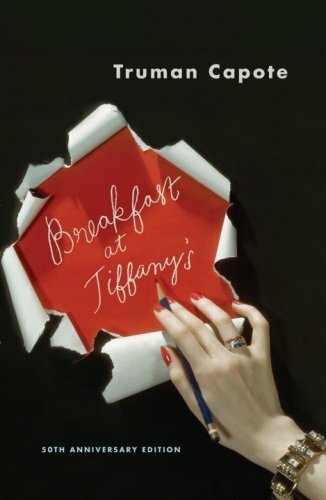 So in my head “Breakfast at Tiffany’s” has always been categorized as “someone else’s favorite movie” and I remembered it more for the odd circumstances in which I saw it, than for any of its own qualities. Love of the movie didn’t compel me to read the book, in other words – just curiosity about Capote’s original story. Now that I’ve basically used this review as an excuse for anecdote/storytime, let me say a few words on the novella itself. It’s definitely an entertaining, well-written read. I have a real soft spot for books that are adept at dialogue, and all the words uttered by Holly Golightly have such a strong sense of tone and wit that her character just pops from the page, like a striking color in a photo. The unnamed narrator bears a strong resemblance to the Great Gatsby‘s Nick Carraway – at one point, he overhears Holly describe him as someone whose “nose is pressed against the glass”. I also enjoyed all the references to the time: the story takes place during World War II but there is only one moment where the war truly touches the lives of the characters. Other than that, there are tantalizing but vague references to draft boards and men in the armed services. There were three other stories included in the ebook version I downloaded from my public library’s Overdrive account, but I had little interest in them. My curiosity extended to Breakfast at Tiffany’s and that’s it. I don’t even think Capote’s In Cold Blood is on my to-read list. As I put together this review, I read a couple of reviews where the bloggers said they liked the short stories better than Breakfast at Tiffany’s. Oh well. 1999. English translation 2005. Grove Press. Hardcover. 149 pages. I read Yoshimoto’s Goodbye Tsugumi several years ago and admired the way Yoshimoto captured the atmosphere of summer nights. With Hardboiled & Hard Luck, the atmosphere is autumnal: “Hardboiled” is a ghost story and “Hard Luck” takes place in November, and uses that season to add an extra layer of meaning to its story about a young woman whose sister is dying. Of the two novellas, I liked “Hardboiled” the best. The unnamed narrator stays the night in a haunted hotel, unwittingly on the anniversary of her ex-lover’s death. The narrator’s dreams of her ex-girlfriend Chizuru and the appearance of a strange visitor lend a slightly creepy tone to the story, though there is an underlying warmth. At least in translation, Yoshimoto’s writing style comes across as very spare, with a few jarring notes. When I reviewed Goodbye Tsugumi years ago, commenters overwhelmingly recommended her novel Kitchen, which I have yet to pick up, but will someday. 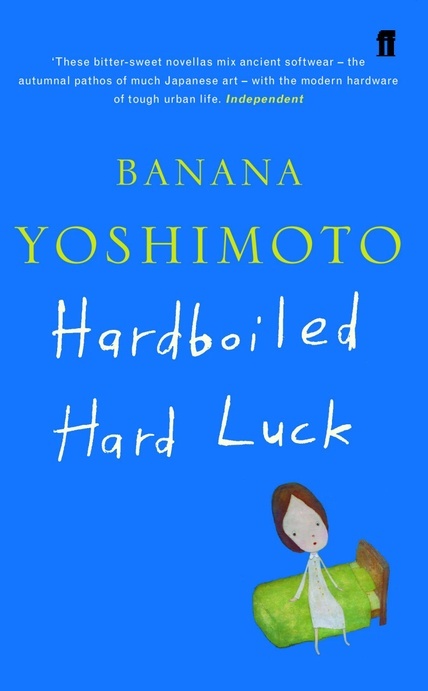 An Adventure in Reading – “[Yoshimoto’s writing is] easy to read, and her female characters are well written, but they don’t make me fall in love with the stories.